This rock formation at the end of the trail was interesting. The best way I could describe what it looked like was to call it a pig with wings. Other people must have had a similar idea, and carved eyes into the sides of what would be the head. 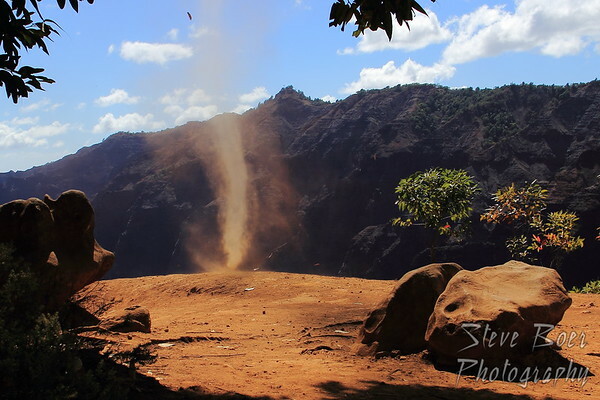 While we were having a rest at the end of the trail, this cool dust devil started up. Fortunately it lasted long enough for me to get a photo. It was a pretty good size, at least a few feet in diameter and probably 20 feet high. Hope everyone had a good Christmas. 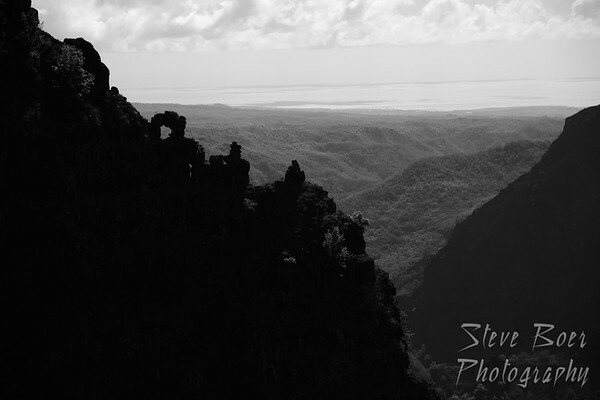 I’ll be continuing with my Kauai photos again, there are still a lot to go through. 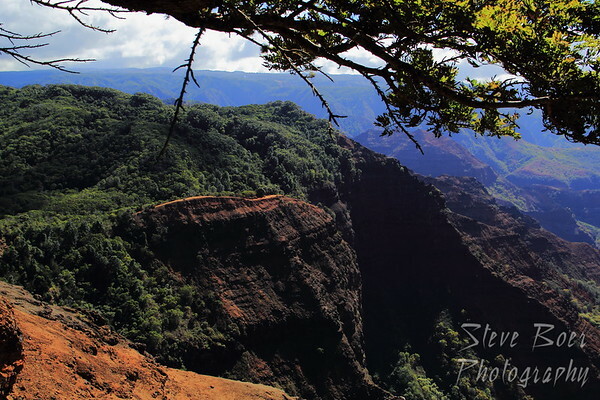 Here’s a shot looking down into Waimea Canyon from the top of Waipo’o Falls. It was a little tricky getting down to this spot from the end of the main trail, but worth it. Once we made it down to the open trail ridge we had a good view through to the ocean. 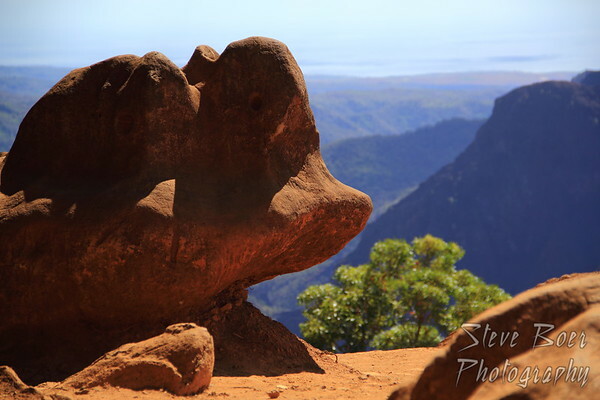 I found the rock formations on a cliff edge to be interesting. They kind of look man-made, but I don’t think they are. Here’s another shot of our destination as we got a little closer. I used a different focal length for this shot, so we weren’t quite as close yet as it might seem. It would be another half an hour before we arrived at that spot. 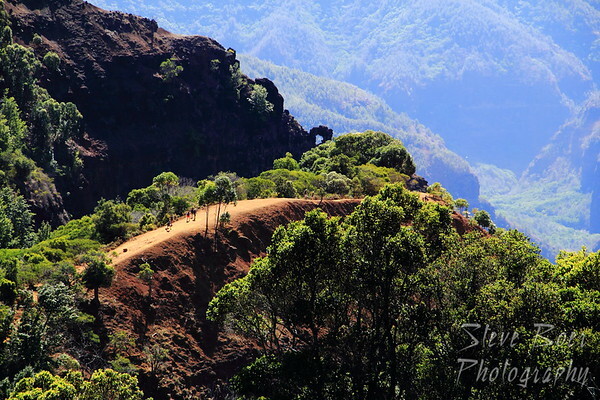 We continued on from the Waimea Canyon lookout area to the trail-head to start our hike. Before long we were given this view. 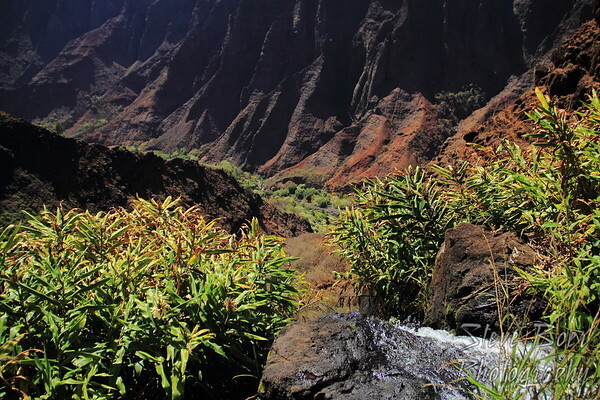 The ridge trail in the distance was our destination, as the Waipo’o falls are right around the corner from there.